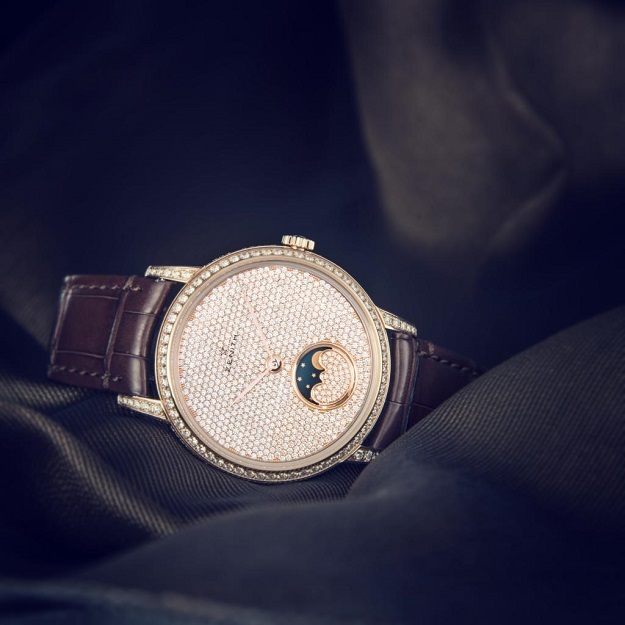 In the wake of the success achieved by the Elite Lady’s model, the Zenith Manufacture is enriching the same collection with two new Elite Lady Moonphase models that embody the essence of refined femininity according to Zenith. In a subtle blend of classicism and modernity, the white mother of pearl set with diamonds beats to the rhythm of the automatic Elite Calibre 692, while the full set with diamonds is equipped with the automatic Elite calibre 690, entirely developed and crafted by Zenith. Best owed with a more than 50-hour power reserve, this ultra-thin movement operating at a frequency of 28,800 vibrations per hour. It’s finely curved in two versions, 36 mm and 33 mm in a rose gold set with diamonds with the dial in two versions: full-set with diamonds or white mother of pearl set with diamonds. Its pure lines embody contemporary elegance from Zenith. The new Elite Lady Moonphase now forms a classic duo radiating an unmistakable aura of elegance and distinction to complete the Zenith Lady’s collection. Newly released and yet already timeless.